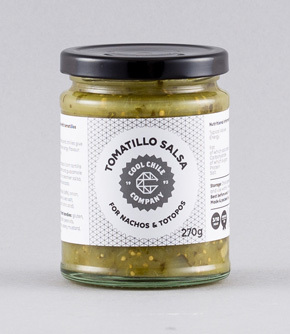 A spicy salsa made with tangy tomatillos (a sour small green fruit) coriander and hot green chilli. We use chillies imported from Mexico to produce our salsas in the UK. For Tomatillo Salsa addicts we have a special case price, 6 jars for the price of 5, just change the size option to find it. Ready to eat. Once opened, refrigerate and use within 1 week. Blend with avocado to make a richer, creamier dip. To serve with enchiladas or chilaquiles, heat the salsa, thinning with a little water or stock if needed. Enchiladas are quick-fried corn tortillas dipped in chilli sauce rolled around a warm filling such as refried beans, potato or chicken and served with more sauce, crema, crumbled cheese and slices of onion. Chilaquiles are totopos (chips) cooked in a sauce and then topped with cream, crumbled cheese and slices of onion.